It all started when three cousins and two friends got together to play rock&roll in a poster-plastered basement in Northampton, Massachusetts, surrounded by stacks of NRBQ, JJ Cale, and Tom Petty records. Embedded in the Connecticut River valley that legends including DinosaUr Jr. and Pixies call home, LuxDeluxe builds on the valley’s history of musical innovation. Churning out high-octane shows that leave audiences sweaty, LuxDeluxe delivers a serious punch of supple Rolling Stones-y grooves, persuasive danceable hooks, and rock-solid old-fashioned craft. Flaunting like Jagger, with all the sensuality of Bowie, lead singer Ned King creates a spectacle rarely seen since the heyday of rock&roll. As the band rapidly gains recognition for their live shows, they’ve been invited to share the stage with the likes of Deer Tick, White Denim, NRBQ, Reptar, Lake Street Dive, Rubblebucket, J Mascis, and Big Al Anderson. 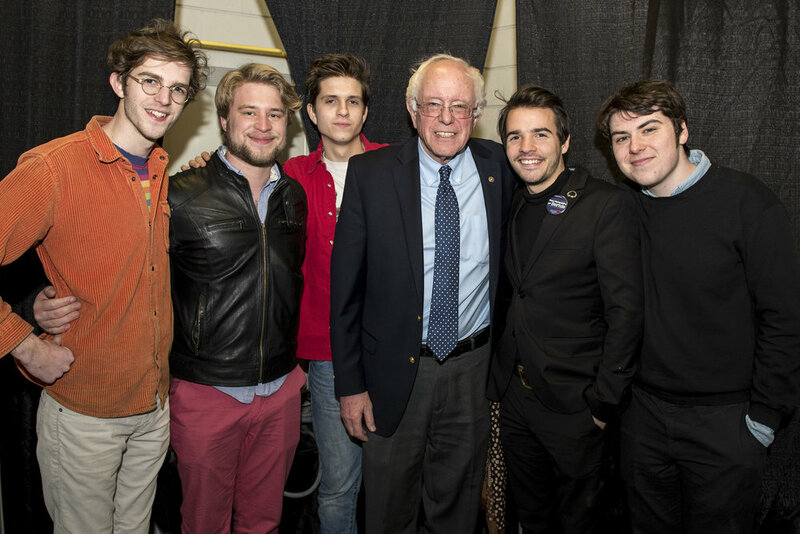 The highlight of last year was warming up a crowd of over 10,000 for VT Senator Bernie Sanders. The band released its second album, “It’s a Girl,” last year, with the song “So Far Away” being chosen as Song of the Year on the tastemaker radio station, 93.9 The River as well as being reviewed and labeled a band to watch for by Pitchfork Magazine. This has been an extremely prolific year. The recently released one-shot visual EP “Midnight Snack” is only the start of the flood of new music to come from LuxDeluxe in 2017. With encyclopedic knowledge of vintage gear, from Gabe Bernini’s Clavinet to Jacob Rosazza’s “Beatle bass” to Caleb Rosazza and Jake Edwards’ collection of vintage guitars, amps, and drum kits, LuxDeluxe’s next release will be their third full-length album, “Let’s Do Lunch.” Comprised completely of songs tracked with vintage equipment on a Tascam Four Track Cassette Recorder and mixed at SpiritHouse Music Studios in Northampton, “Let’s Do Lunch” puts the listener amongst the band during late-night recording sessions, at the center of the synchronicity only family can create, and at the heart of their influences.